There are currently around 40,000 people in the UK with a spinal cord injury. On average a further 3 people will incur a spinal injury every day and as a result become a permanent wheelchair user. At present there is no cure. ASPIRE works with people with spinal cord injury to create opportunity, choice and independence from the moment of their injury and for the rest of their lives. As a leading spinal cord injury charity our philosophy is to reintegrate spinally injured people back into society after their injury and to encourage, facilitate and enable them to reach their full potential. In choosing to be part of the ASPIRE running team you will help to change the lives of those who, through their spinal cord injury, may never walk or run again. 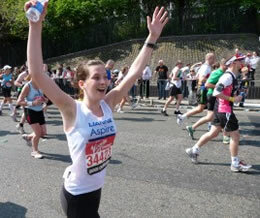 Whether you have your own place in the race or would like to apply for one of our own Guaranteed places, ASPIRE would love to hear from you and have you on the team at the 2019 Virgin Money London Marathon.